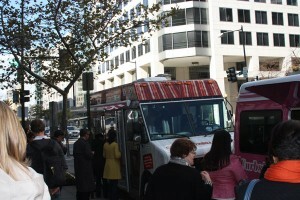 It has been hard to ignore the recent surge in food trucks in the DC area over the last few months. We’re not sure if the popularity has grown from the Food Network show, or just the fact that DC is usually a few months (or even years) behind other major cities when it comes to the latest food trends, but it appears that food trucks are hugely popular, and hopefully they are here to stay. 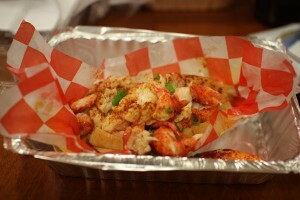 The one food truck that has stuck out in our minds as a “must visit” is the Red Hook Lobster Pound. Word spread quickly when the truck debuted back in August that this was a big deal as they already had an established truck in New York City and were known for using fresh lobster meat shipped daily from Maine. 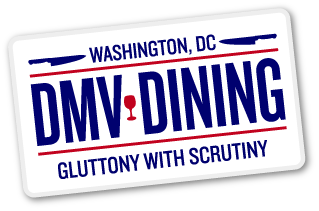 We had been dying to try this truck, except the only problem is that neither of us works downtown, and it doesn’t seem like they are going to be traveling to Bethesda or Hyattsville anytime soon. We didn’t even bother trying to score some lobster rolls at the Curbside Kickoff as the lines were ridiculously long and barely moving. Luckily, we both have the same flex day schedule, so after learning on Twitter that their Lobby One truck would be set up by Farragut North, we made it our mission to finally have some lobster rolls for lunch. The plan was for Brett to get there a little early in order to start waiting in line while I finished my final long run before my upcoming half marathon. Their Twitter announcement said that they would get there at 11:30am, and by the time I reached Brett just ten minutes later, there was already a line almost down the street. Luckily we didn’t have to wait too long, but it was a sight to be seen nonetheless. 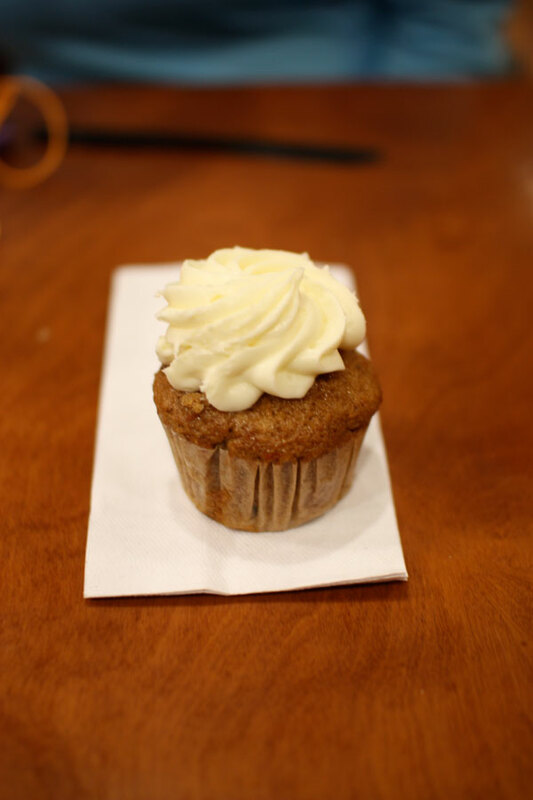 There was a camera crew set up from ABC News interviewing the employees, while next to Red Hook was Curbside Cupcakes, which barely had a line. 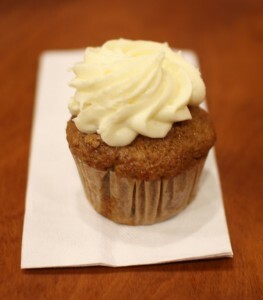 This was pretty smart for them since many people, including us, decided to purchase a cupcake while waiting in line. When we finally got to the front to place our order, we decided to get one Traditional roll meal, as well as one Connecticut roll. 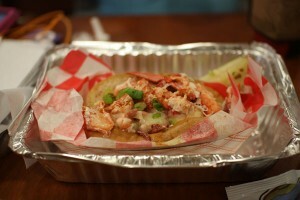 The Traditional roll consisted of cold chucks of lobster meat mixed with light mayo and scallions in a buttery roll. 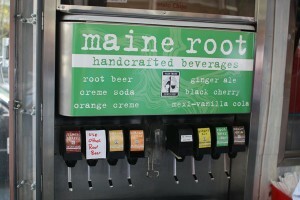 The meal also came with Cape Cod chips and a choice of Maine Root soda. Brett decided to try the Connecticut roll, which consisted of lobster steamed with butter in a roll. 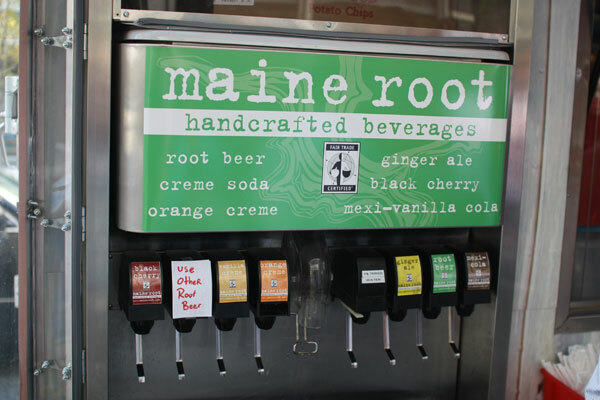 We also got a root beer to go with it from the truck’s built-in soda fountain, and took our sandwiches and carrot cake cupcake to the nearby Borders to eat. The one drawback in regards to not working nearby was that it was tough to find a place to eat given the chilly fall weather. Finally, the time had come to try these infamous rolls. 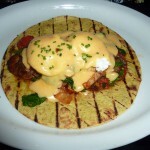 Just looking at mine, you could see huge, full lobster claws stuffed inside as the meat was pouring out of the roll. There was so much lobster that it was hard to keep it from spilling out. Every bite was to die for as the mixture of the lobster with the celery and mayo was perfect while not being too heavy. I was in heaven and did not want the sandwich to end. Meanwhile, Brett devoured his Connecticut roll and was impressed with not only the quantity of lobster meat stuffed inside, but how succulent it was. It turned out to be a double-edged sword as the plethora of butter found inside the roll instantly made it soggy and hard to eat with his hands without it falling apart. He wound up having to use a fork in the end but it didn’t matter as he still came away impressed despite the bread-related difficulties. I’ll flat-out say that I was a little skeptical that the Lobster Pound was worth both the time and money. Considering that this was a food truck, our lunch was certainly no bargain. My meal, which consisted of a roll with chips and a drink, came out to $18, while Brett’s sandwich alone cost $15. On top of that $33 bill, we still needed to find a place to eat. Overall, we were glad that we were finally able to try these and have to say, if we worked nearby to where they routinely set up, this blog would suffer from a lack of non-lobster truck-related content.